You are currently looking at a MOBILE SUIT GUNDAM THE 08th MS TEAM VOL 1 (DVD) (English & Japanese audio) In excellent like new condition 100% complete. Box has light wear. See pictures or contact for further details on condition. The longest running of all the GUNDAM series, THE 08TH MS TEAM is an OVA series that takes place in the year 0079 of the Universal Century. It finds the Earth Federation and the space colonies at the tail end of the same One Year War where the original GUNDAM took place. On the brink of defeat at the hands of the Principality of Zeon and their giant humanoid fighting machines, known as mobile suits, the Federation begins testing their own mobile suits in Southeast Asia. 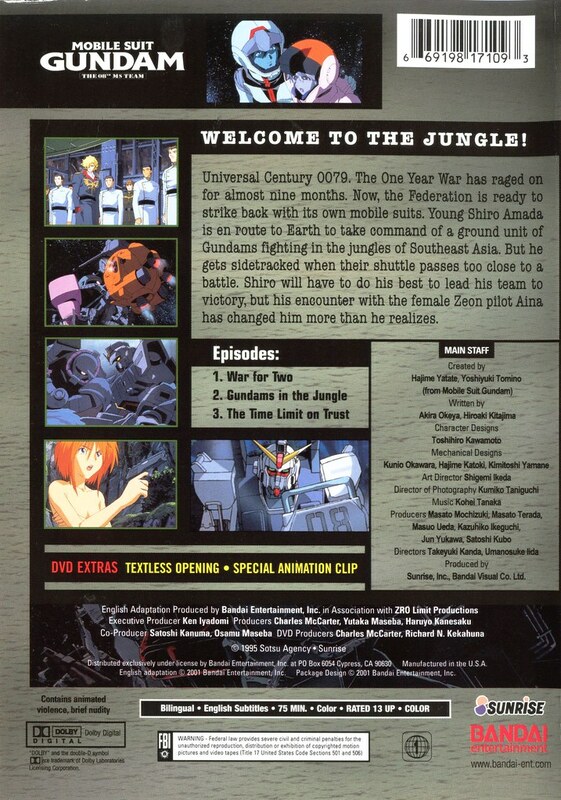 Incredibly, an inexperienced young officer named Shiro Amada is given command of the 08th Mobile Suit Team and he finds himself immediately tested when his team is sent to capture a Zeon occupied village.